The solution: offline the disk group from Microsoft fail over cluster, this will export the group in vea. once exported you can import the group again as a local dynamic group. You will then be able to remove that last disk. If you click on the blue link in the error it will take you to symantec’s site and tell you to restart, well that did not work for me. First look at your new disk and see if it looks like the below screenshot. If your disk looks like the second one with a “blue i” then your disk is offline you need to online the disk to make it look like the top disk from the screenshot. 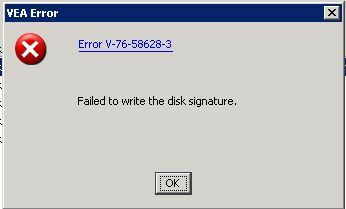 Then you should be able to write your disk signature after you online the disk.